Located in Lisbon’s upscale area of Amoreiras, EPIC SANA is a new built hotel featuring a rooftop infinity pool. Marquês de Pombal metro station is 700 metres away. 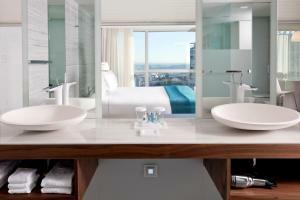 Featuring a contemporary-style décor, each room includes a flat-screen TV and mini-bar. Some rooms provide views of Lisbon. Free Wi-Fi access is available. Every day a breakfast buffet is served in the elegant breakfast room or in guests’ own room. After tasting a meal at the gourmet restaurant, the Upscale bar is available for a drink. 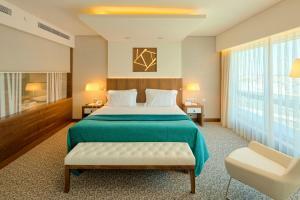 EPIC SANA Lisboa Hotel offers meeting rooms for guests’ business needs. The 24-hour reception can arrange babysitting services or help organising laundry and ironing services. Guests wishing to relax can head to both indoor and outdoor pools and enjoy a pampering massage at the spa. Lisbon International Airport is 6.7 km away, and Amoreiras shopping centre is around 300 metres away. 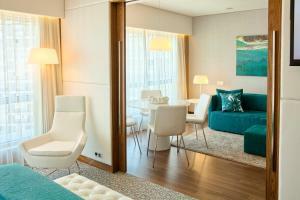 EPIC SANA Lisboa Hotel is around 20 minutes by public transports from the lively Bairro Alto district. This luxurious, air-conditioned suite offers views of Lisbon city. Featuring contemporary-style décor, each suite features a separate dining and seating area with a flat-screen TV, an espresso coffee machine and a minibar. The private bathroom comes with a bath and shower, hairdryer, a magnifying mirror and free Azzaro toiletries. This luxurious, air-conditioned junior suite offers views of Lisbon city. Featuring contemporary-style décor, each junior suite features a flat-screen TV, an espresso coffee machine and a minibar. 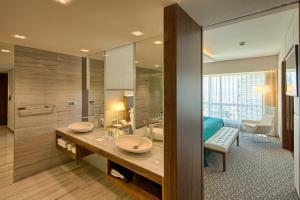 Each private bathroom comes with a bath and shower, hairdryer, a magnifying mirror and free Azzaro toiletries. Featuring contemporary-style décor, this room features a seating area with a flat-screen TV, a coffee machine and a minibar. Each private bathroom comes with a bath or shower, hairdryer, magnifying mirror and free toiletries. Rate: € 135.00 ... € 560.00; select dates below to get current rates. This room includes: - 1 Welcome drink per person at the Bar; - Special VIP welcome package in the room; - Daily newspaper; - Free Parking. Rate: € 159.58 ... € 510.00; select dates below to get current rates.